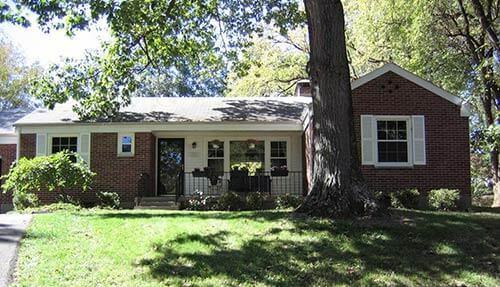 Susan — a long-time renter — recently finally found the house of her dreams in a 1952 red brick ranch in a great neighborhood. Isn’t it… perfect! The house was listed as a fixer upper — but that didn’t intimidate Susan, who had been a DIY apprentice to her dad. In 2010, after many years of renting, I was tired of never being able to make a place my own and decided to buy a house. I’ve always been a handy gal, having helped my dad with many basic carpentry, electrical, and plumbing projects, so I wasn’t afraid of fixers. When a two-bedroom, 1952 red brick ranch in a fantastic neighborhood came on the market, I jumped at the chance to take a look. The house had belonged to a local family for nearly 50 years, but had been a rental for about half that time before sitting empty for two years. Neglected, it needed a lot of updating but had good bones: huge living room windows, gorgeous oak hardwoods, sunroom with 18 original awning windows and jalousie door, and a half bath with original yellow and maroon wall tile. I was in love! 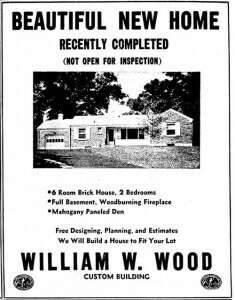 Shortly after moving in, I found the original builder’s advertisement featuring my house in a local newspaper. Sixty years later, the outside is relatively unchanged, save for the loss of the charming garage cupola and the delicate little tree which is now a towering oak! Inside, however, was a different story. The mahogany paneled den had been painted, and one bath and the kitchen had been remodeled in the 1980s, complete with white melamine and pickled wood cabinets and a peel and stick vinyl floor that had seen better days. The day I signed the papers, I started ripping out that tile! I knew I wanted to update the space, but I also wanted to keep some retro styling that fit with the age of the house, so I chose to go with a checkerboard pattern. I worried that traditional black and white would overwhelm the 10×10 room, so I went with gray and white instead. Working on a budget, I chose to put down inexpensive peel and stick I found on eBay as a temporary, but attractive choice; plus it was easy to trim pieces to fit with scissors. 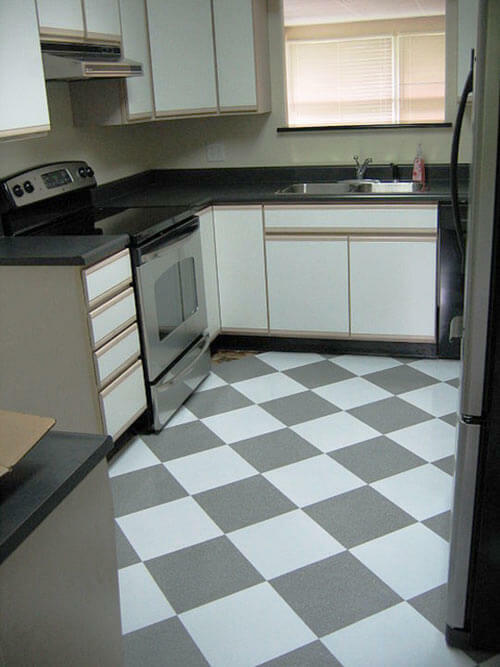 From start to finish, the floor took approximately two days and gave the room a retro-modern twist. Two years later, the floor has held up remarkably well, and the tiles are simple to replace, although I’m not sure I would recommend peel and stick for heavily trafficked areas or large families. My plan is to upgrade the peel and stick with Armstrong’s commercial vinyl squares in the same pattern and colors. I didn’t start renovating the rest of the kitchen until this past summer, when I had a large chunk of free time to tackle those cabinets! 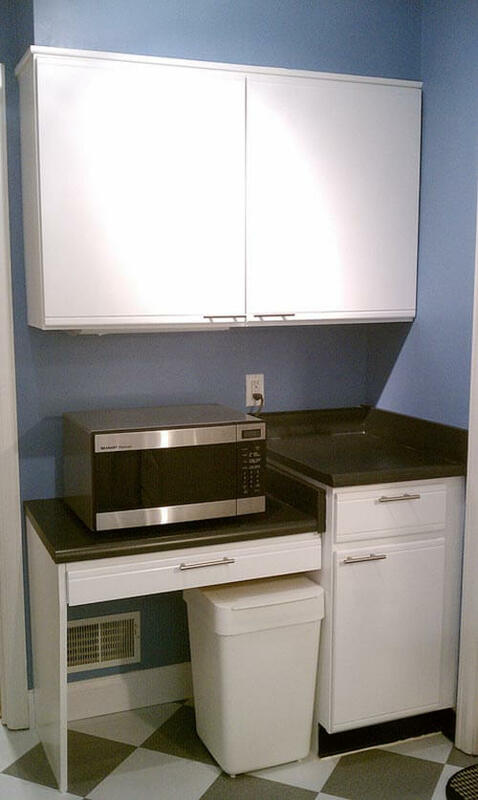 I was sure I wanted to go with white because light and bright would work better in the small space. Plus, the backsides of the cabinet doors already were white, so that would save me from having to paint both sides. I had worked with Rustoleum’s Cabinet Transformations on my oak bathroom cabinet with great results, so I was confident it would work well in the kitchen. The boxes were pickled wood veneer but in great shape, so they took the treatment without trouble. I was surprised, however, at how well the melamine doors turned out! I did the same prep and application as I had for the boxes, using Pure White and a regular bristled brush to cover the fronts and edges. I got lucky that the color matched the backside perfectly. After two coats each of bond and top coats (I chose not to use the glaze), the final result gave the door fronts a wood-grain-like texture that blends well with the boxes. I added stainless steel bar pulls, choosing to install them on the horizontal to match the groove along the tops and bottoms of the doors, helping hide some of the ‘80s style that lies beneath. It took about two weeks to get the job done, but it was well worth the time and effort. Not long after I moved in, I had hired an electrician to replace an old flourescent light with an IKEA, retro-styled fixture that resembles the rocket-inspired taillights on a 1959 Cadillac Eldorado. The old hood range, on the other hand, sounded like a 747 when started, so I swapped it with a clean-looking and quiet stainless model. Since it’s unvented, installation was a snap—just a couple of wires and screws to take down the old one and put up the new. I painted the walls with a medium blue from Eddie Bauer Home called “Gingham,” which helped the tiles and cabinets pop without being too dark. 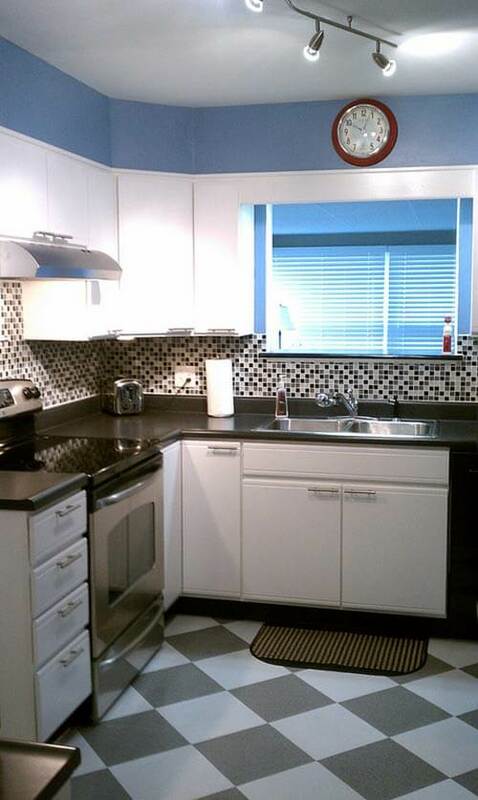 I chose American Olean’s Legacy Glass mosaic tile for the backsplash, picking up the gray floor, black counters, and white cabinets with their Delfino Black Magic pattern. It was my first tile installation, so I did a lot of internet research beforehand and read the company’s guidelines before starting. I moved the stove out of the way and mounted a cleat to the wall to make certain the tile stayed square and level where there was no countertop to guide it. Luck was on my side and I was able to install full tiles along both walls. I had to use glass nippers, though, to cut pieces to fit under the hood and the window opening over the sink, but had some trouble getting clean cuts. Fortunately, the window sill hides most of my mistakes. Tiling and grouting took two days and really transformed the feel, adding some real pizazz to the room! I used thinset made specifically for glass tile and unsanded grout that wouldn’t scratch, making sure to clean off the grout before it dried, or else I would have been chipping and chiseling for hours! A few red accent pieces—a Sterling & Noble retro-inspired clock from Target, coffee maker, and giant fork I spray painted—added some color, contrast, and whimsy. Thanks to some closeouts at Lowes, I was able to pick up a new refrigerator and stove for about $1100, keeping the existing dishwasher and black laminate countertops, both of which were in good condition. My next step is to leaf through several 1952 House & Garden issues I got from eBay for an advertisement or two I can frame and hang that will help tie everything together. 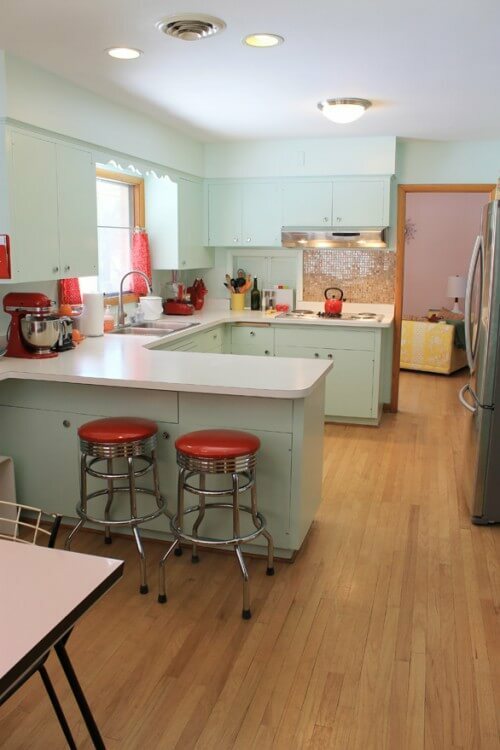 All told, I spent three or four weeks’ time and approximately $600 (without appliances) transforming my kitchen from dated 1980s to retro-modern 2013! I also made over the bathroom in a similar style and on a small budget ($500). Above: Susan’s bathroom before … and after. Susan — what an adorable home you have. The best part is that you used affordable resources and your know-how to transform both your kitchen and bathroom from the marred by abuse state they were in — to their present cheery and clean state. Congratulations on a job well done — and thanks so much for sharing your story and photos with all of us. Susan’s kitchen is exactly like mine. We followed her plan and are really pleased with the result. At the moment we are about to install the door handles, I see from the pics the handles are mounted inside the groove of the wooden trim. As I hold my handles to the trim they do not seem to be flush against the wood. Was this the case when you installed yours. Love the make over but also confuse about how to install the handles inside the grooves.Please expain. 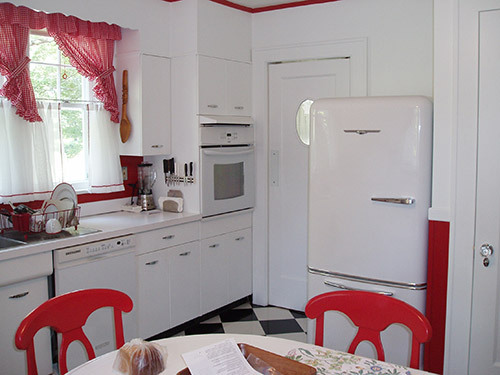 Just wondering if anyone has just painted the oak trim at the top of the cabinets and if so, what did you use and do you recall what color white? 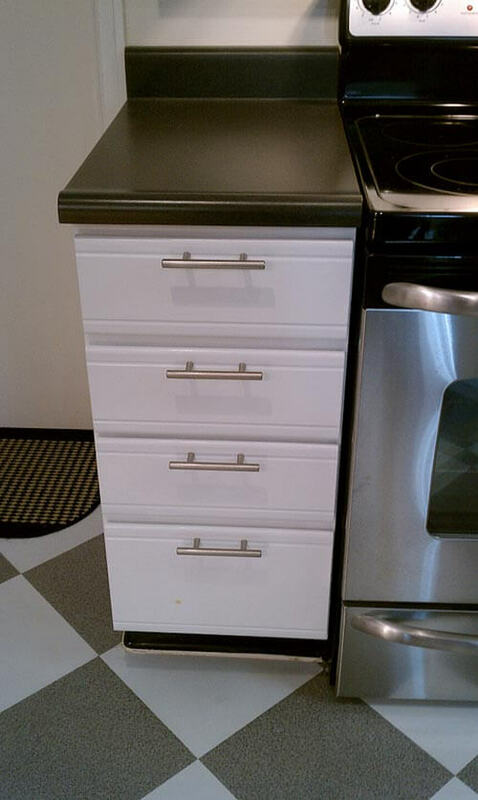 I hate to have to repaint the entire cabinets faces. 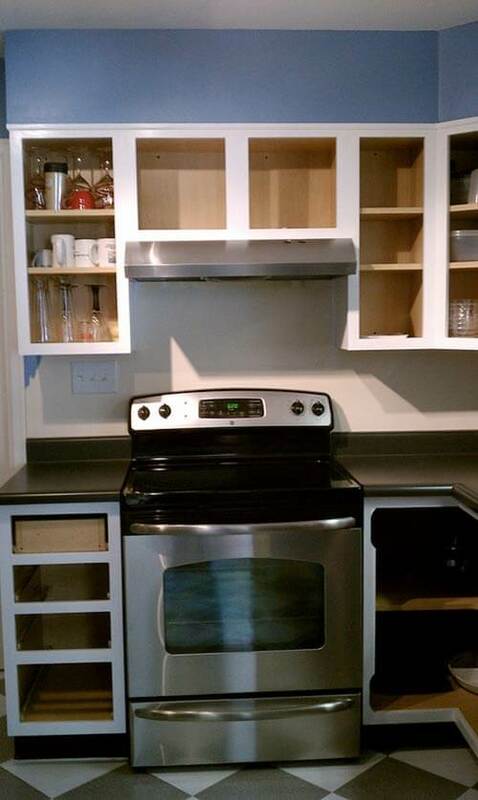 I love the outcome of your kitchen cabinets. I was wondering if you could tell me if the paint has lasted. Any chips or peeling occurring? Any advice and updates are appreciated! Thanks! 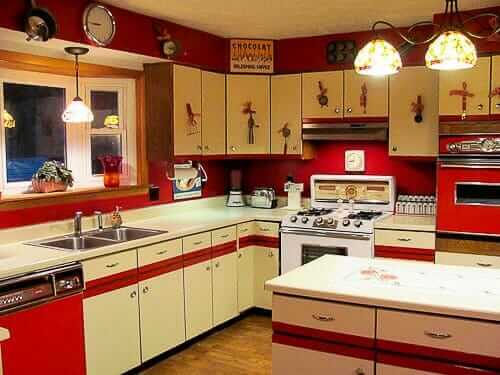 I have the same 80’s cabinets. I removed one of the doors and took it to sherwin Williams and had them match the color of the melamine. I sanded the wood trim and only painted it. It came out really well. Probably a lot cheaper too??????? ?